Our newest and best e-bike tuning for all Yamaha mid-mounted drives. New streamlined casing with patented snap-lock fastening for even faster mounting and release. Even more robust thanks to a special casting compound from the automotive industry. 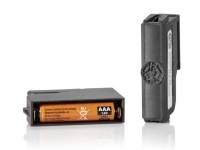 New electronics for even greater range with a single AAA battery. A quality product designed and manufactured by us in Germany. The badassBox 4 is the result of more than a year's development. We have completely re-designed the casing, made it more streamline and replaced the o-ring of the previous version with our patented snap-lock fastening. Making it more streamline makes it even easier to fit. The new snap-lock fastening means you can attach and remove your badassBox with just one hand in seconds. At customer's request, we have additionally added an optional securing feature on the snap lock using a cable tie. 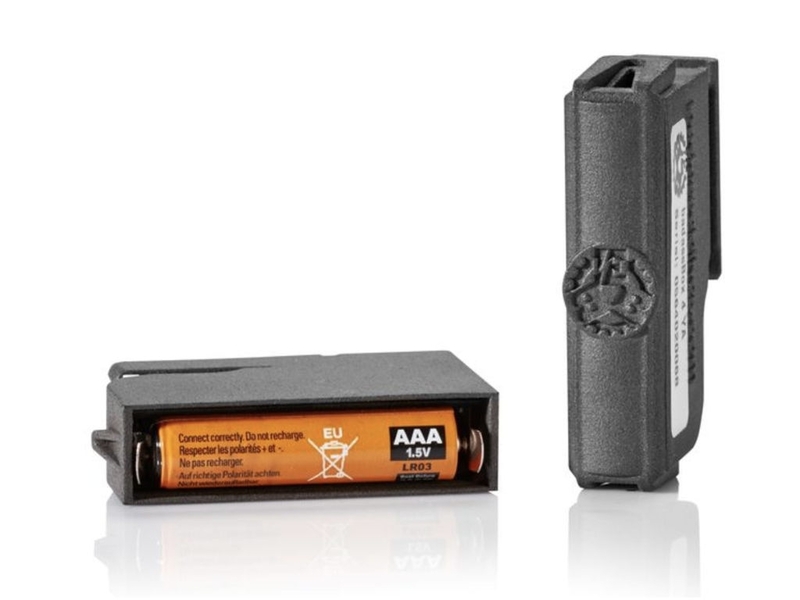 The CR2 battery has been replaced with a AAA battery, so you can pick up replacement batteries much cheaper on just about any street corner. Tool-free battery change can be carried out quickly and easily while you're on the road – but should only be necessary once a year, or every 7000km. This was made possible by our in-house developed and patented field amplification technology FEET (Field Enhancement & Elimination Technology). To protect against moisture and mechanical stress, the electronics are glued into the casing and completely sealed with a special casting compound. The badassBox is developed and manufactured exclusively by us in-house. Before and after casting we check each badassBox individually. Customer satisfaction and quality are our top priorities. If you have any questions, don't hesitate to ask – we'll get back to you with an answer straightaway, mostly on the same working day. Due to the high quality and our focus on customer satisfaction, we additionally offer a 3-month money-back guarantee. The badassBox is attached to the speed sensor of the e-bike and overrides the 25km/h speed limit. Remove it and your e-bike is restored to its original state. The badassBox 4 Yamaha is fitted over the Yamaha speed sensor next to the rear wheel. 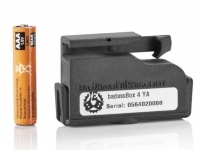 When the snap-lock clicks into position, the badassBox is fitted securely to the sensor. For extra secure fitting, the badassBox can also be fastened with a zip tie. When the badassBox is first fitted, the spoke magnet that comes with it must be mounted in place of the original magnet. Without the badassBox, our spoke magnet functions identically to the original magnet, but when the badassBox is fitted, the spoke magnet is necessary for our patented field enhancement technology to work properly. Once the badassBox has been fitted onto the sensor, the spoke magnet must be offset to the casing edge in the direction of the snap-lock clasp. If the spoke magnet touches the badassBox, it must be repositioned as near as possible next to the badassBox and turned through ninety degrees. It's now ready for use. Following removal of the badassBox, the spoke magnet must be returned to its original position. 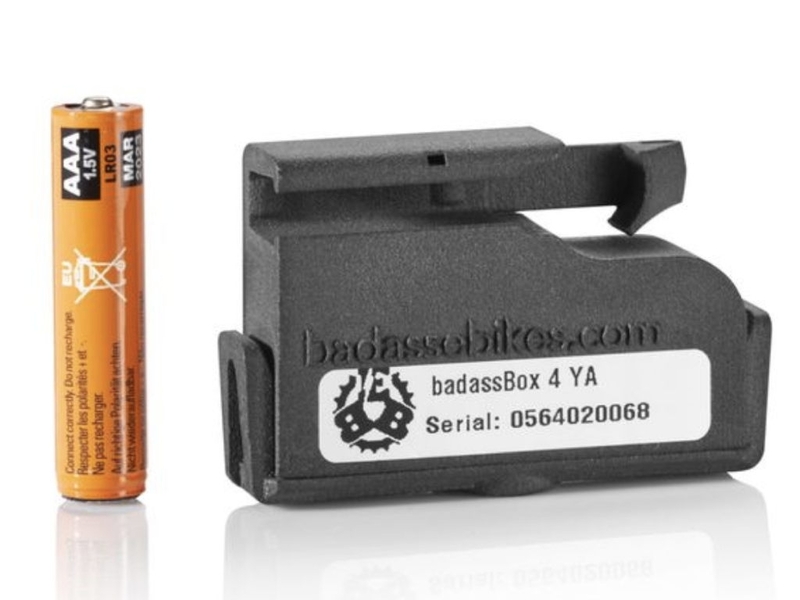 The contactless and wireless badassBox transmits a modified signal in order to override the speed limit of your e-bike – without interfering with the motor's electronic circuitry or software. There's no need to open the motor and there is no risk of damaging it. The badassBox can be fitted in seconds – and just as quickly removed, restoring your e-bike to its former road-legal condition. For all these advantages, a wrong speed, and values derived from it, are displayed. We recommend the use of GPS-related accessories for a more precise data acquisition of driving data (smartphone, bike computer, etc.). eBike tuning that simply works. Requests for merchant bikes welcome. After considering, access to B2B area.